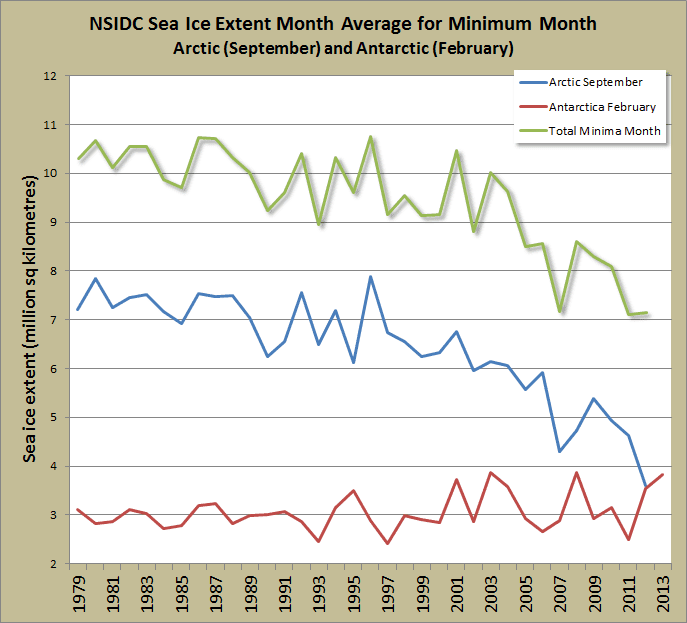 Science deniers are making a lot out of the growth in Antarctic sea ice, mostly over winter. Strangely enough they aren't accusing scientists of fabricating the data, for a change. Here's a chart from The Cryosphere Today (not, as Anthony's ill-informed "guest" referred to it, Today Cryosphere or maybe just Cryosphere). It's hit a record high for this time of year - ie since 1979. ...on average the Antarctic Sea Ice Area is going up by 0.2% per year, and the average thickness is going up 0.2% per year, resulting in an average sea ice volume increase of 0.4% per year. However, these numbers are orders of magnitude lower than the corresponding changes taking place to the Arctic Sea Ice. I did this chart last year (you can read my previous article on the subject here, with some reading material about models not projecting the observed increase in Antarctic sea ice). I combined the Arctic and Antarctic at their respective minima to illustrate the point. That means I've put the September values in the Arctic with the February values for Antarctica. It's missing the latest years. I'll update it after September if I remember to do so. Click to see it larger, as always. Denialist should be aware that not only is the average water temperature in the Southern Ocean increasing with time, but also the air temperature above the Southern Ocean is increasing with time, and the following linked research makes it clear that the most significant reason why the Antarctic Sea Ice is increasing is due to the formation of the seasonal Antarctic ozone hole after the mid-1980's created by anthropologically induced chlorides in the upper atmosphere over Antarctica; which in turn caused the circumpolar Antarctic westerly wind velocity to increase (see the following abstract for the influence of this increased wind velocity on the Antarctic Sea Ice); and the linked reference indicates that the intensifying regional winds in Antarctic is one of the most significant factors accounting for the increasing maximum extent of Antarctic sea ice. There is a lot of useful information and references to scientific papers in that thread. I don't have time to research and write about this right now. And I doubt I could do it any better than AbruptSLR in any case, and probably a lot worse. Again, here is a link to the discussion. It's well worth a read, especially for anyone who wants to rebut denialist nonsense on the subject. As for what's happening in the Arctic, well somewhat surprisingly, the ice extent is dropping quite a bit. It doesn't look as if it will break the 2012 record low though. Neven's blog is the place to go to keep up with what's happening there. It appears that reality does not agree with the computer models. Looks kinda like a hockey stick, doesn’t it? It is all so logical, it is astounding that no one can catch onto a very simple principle. At the north pole, when sea ice trends to diminish, that means it is a sign of global warming. However, at the south pole, on the opposite side of the earth, sea ice is increasing. But since this is on the opposite end of the earth, increasing sea ice means that is a sign of global warming. These are opposite poles you see, so the exact opposite trend means the same thing. It is all global warming! "It doesn't look as if it will break the 2012 record low though"
Melting's ahead of 2012 at the moment - this plot may be clearer. Only 2010 had more melting at this stage. Melting is high because last year was higher than the trend line, which left more ice to melt as this year gets back to the trend line. The winter 2012-3 had a record freeze, for much the same reason. I'm skeptical that same-year deltas mean much. According to my understanding, sea ice extent is an absolute measure, numerobis, not relative. So while Nick may have phrased it in terms of melting - which could be construed as a relative measure - the sea ice extent *is* currently less that it was in record melt year 2012. However, it's early days yet, and difficult to tell what will happen by September. Ah; a few days ago when Neven last posted, IJIS was not that low; CT still isn't. I should have looked more closely before misreading Nick's comment. "Instead of JAXA, I always use the NSIDC figures"
I'm now tabulating and plotting NSIDC (NH and SH) as well. The Daily Mail has a couple of articles today. One by our old chum David Rose crowing that Antarctic sea ice is spreading. And one by Bishop Hill himself, Andrew Mountford, cunningly described as a "Climate Change Author". Read and weep. Or Laugh. A reference in case anyone needs this: Increase in Antarctic Sea Ice due to global warming was predicted by Manabe in 1991. For example, in re­sponse to the increase of atmospheric carbon dioxide, the excess of precipitation over evaporation increases, and surface salinity is reduced in high latitudes as noted in section 8. Thus, the static stability of the near-surface water increases and the convective mixing of cold sur­face water with the relatively warm subsurface water is reduced, thereby contributing to the reduction of sea surface temperature in the Circumpolar Ocean. This is why sea surface temperature hardly changes and sea ice slightly increases near the Antarctic Continent in response to the increase of atmospheric carbon dioxide.